Bath Lifts and Recliner Lift Chairs help provide comfort, support and safety for you, and give you back your independence to manage your personal care when bathing. For people with reduced strength, balance and co-ordination, or perhaps an illness or health concern, bathing can be a real problem. However, there are a range of Bath lifts and Chairs available that will suit all your bathroom mobility aid needs. Okay, so let’s look at the benefits of having one. Gives a person increased confidence and independence to manage their personal care, allowing them to bathe whenever they wish. Safety is of paramount importance for anyone who wants to bathe. A bath lift provides reassurance that you can safely transfer in and out of the bath without the need for stepping, greatly reducing the risk of falling. Many of the bath lifts are fitted with cushion seating and back support which can help people particularly with different types of arthritis and joint pain. In addition, some bath lifts have reclining backs which allows you to tilt back and relax, just as if you were sitting in the bath normally. Most of the bath lifts are very easy to set up and dismantle, with easy to use hand controls requiring very little instructions to use. They provide a cheaper alternative than making alterations to your bathroom, such as a wet room or walk in shower. Battery-powered bath lifts are probably one of the most popular type used, simply because they eliminate the need for any electrical connection or transformer. They have an indicator light to let you know how well charged the battery is and when to dismantle. 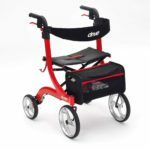 The battery is concealed neatly away and when fully charged can provide up to 20 lifts of the chair. The actual number may vary and is dependent on the bath lift model, condition of the battery and the user’s weight. Most hand set controls are controlled by press buttons and are normally situated conveniently at the side of the bath. For a person with weak or arthritic hands there are handsets with special toggle switches. 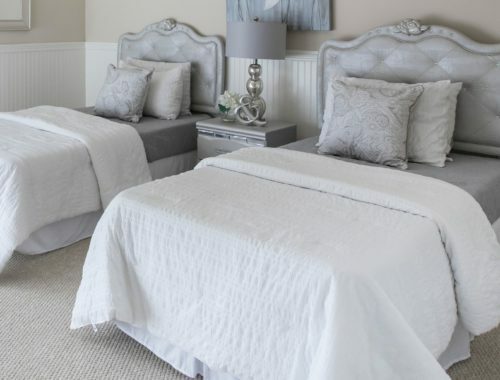 Aquila, Bellavita and Deltis are all popular well known makes to choose from. The NRS Healthcare Aquila Bath Lift is one of the lightest and easiest bath lifts to install or remove for cleaning. comfort for the user, particularly in a reclining position. The Bellavita Lightweight Reclining Bath Lift is the lightest battery-powered reclining bath lift available, the seat backrest reclines to a market leading 50º, and also the seat is one of the highest at 48cm (18.9″). It is lightweight and portable, ideal for easy transportation and storage. All in all the Bellavita offers the user a wondeful bathing experience. Click here to read my personal review of the Bellavita. Another high performance bath lift is the Bathmaster Deltis Reclining Bath Lift. The back recline at 40 degrees is a little less than the Bellavita, but it has an optional swivel and transfer seat attachment, which makes life easier when transferring on and off it. Perhaps the main benefits of it are it is easy to assemble and dismantle, and has a quick rechargeable battery, allowing six lifts of the chair before the need to recharge. is low is a useful addition to have. So let’s look at the all important cost of the three we discussed. Well the Bathmaster Deltis Reclining Bath Lift is around the £270 mark, with an additional £110 for the swivel seat attachment. The Bellavita Reclining Bath Lift is around the £190-£200, and the Aquila Bath Lift is around the £300 mark. Obviously prices change from week to week depending on deals, so these prices are only a guide. Air-inflatable bath seat lifts use compressed air to inflate and deflate the bath seat, thus raising and lowering the user in their bath. 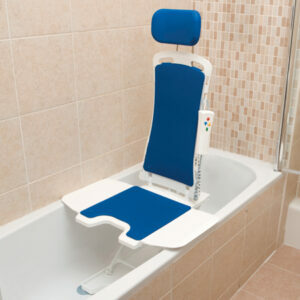 Unlike other types of bath lift chairs, inflatable bath lifts are lighter to remove. This is useful if other members of the household also use the bath. Although comfortable and supportive to sit on, this type of bath lift chair may not be suitable for someone who has poor sitting balance. Also, the flexible surface of the seat does move when you transfer your body weight, and may make it difficult for some users to get off it. The Mangar Bathing Cushion is a popular choice for many people. Ideal for taking away with you when travelling, this easy to use bath lift weighs just two kilograms. Manual bath lifts are operated hydraulically, using the weight of the person to lower the lift and the buoyancy of the water to help to raise the lift. When you are ready to get out of the bath, a hydraulic mechanism release and the buoyancy of the water helps raise you again. The hydraulic mechanism is preset for the user’s weight. Ideally to use a Manual Bath Lift you need good upper body strength in your arms and good core stability, so it is not suitable for everyone. 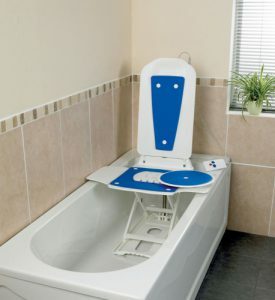 It is also worth considering that this type of bath lift does not have any back support so requires the user to have good sitting balance when in use. Wall & Floor Bath Lift Chairs or Band Bath Lifts as they are known, consist of a fabric band on a roller which retracts into the wall-fixed unit. The band pulls out, runs across the bath rim and slots into a floor mounted bracket. The user is lowered into the bath by a mains or battery powered motor, which rotates the roller letting out more of the fabric band. To lift the user up again the roller is rotated in the opposite direction. With a built in battery powered remote control and thermometer, the Relaxa Belt Bath Lifter has an anti-reversal safety mechanism, and has a maximum user weight limit of 20 Stones. 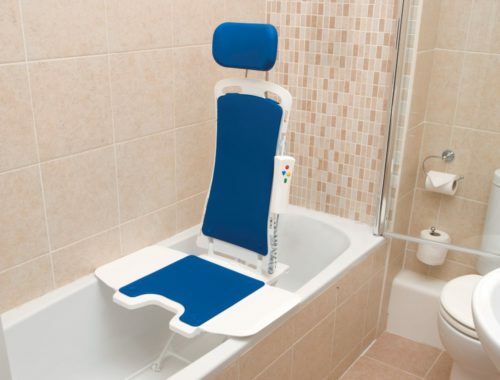 Unlike some other bath lift chairs such as the battery-powered ones, the advantage of the Band bath Lifts is that the user is able to sit virtually at the bottom of the bath when bathing, and lie back against the slopping bath support. They are suitable for someone with good sitting balance and co-ordination to use safely, however as an optional extra a back support is available to help you. 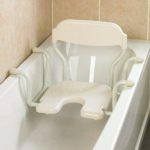 An advantage of using a Band Bath Lift as opposed to a conventional bath lift chair is it takes up very little room when not in use, neatly folding away, allowing other family members to bathe easily. Although most bath heights are generally a standard height, they do vary. Check the maximum height that the bath lift will raise to, in other words, its starting height. It needs to be at least the same height as the top of the bath to allow easy access on and off it. The maximum height of bath lift chairs varies from between 17″ up to 23″. With regard to the minimum height, the lowest height is 6cm ( 2.3″ ) from the bottom which is the battery-powered Bellavita Reclining Bath Lift Chair. Some air-inflatable chairs can go as low as 2″. Most bath lift chairs have a weight capacity between 18 to 28.5 Stones ( 250 to 400 lbs ). This is very much a personal choice as to which you may prefer. The battery-powered bath lift chairs have both upright and recline models available. Upright fixed models may be suitable for someone who has a degenerative back condition, or problems that makes it difficult to alter their posture into a reclined position. The advantage of having a reclining chair is it allows you to have a proper soak in the bath and can be very relaxing and comfortable for some users. Most of the battery-powered chairs recline to around 40 degrees, although some recline to 50 degrees. The comfort of both seat and back rest is very important. Some seats and backrests have a smooth surface, whilst some have a textured surface which is slip resistant. Transferring on and off the chair can be a little easier with a smooth surfaced seat, but it is a personal choice. Some bath lifts are available with or without the protection of antimicrobial and dirt repellent surfaces making it incredibly hygienic and easy to clean. Special additives create a unique air cushion on the surface of some chairs, which repels dirt and water, making it a lot easier to clean. The width of the seat is important as you want it to be wide enough to offer sufficient support when sat on it. Most of the seat widths vary between 15 – 36″ depending on the make and model. Many of the battery-powered bath lifts have side flaps to them which fold in as you are lowered in to the bath, and then open out once raised again. The wider the side flaps are the further they will extend over the side of the bath, making transferring onto the seat easier. Many of the battery-powered bath lifts have an added safety feature within their chairs, which means that the bath lift will not lower into the bath unless the battery has sufficient charge to raise you again. 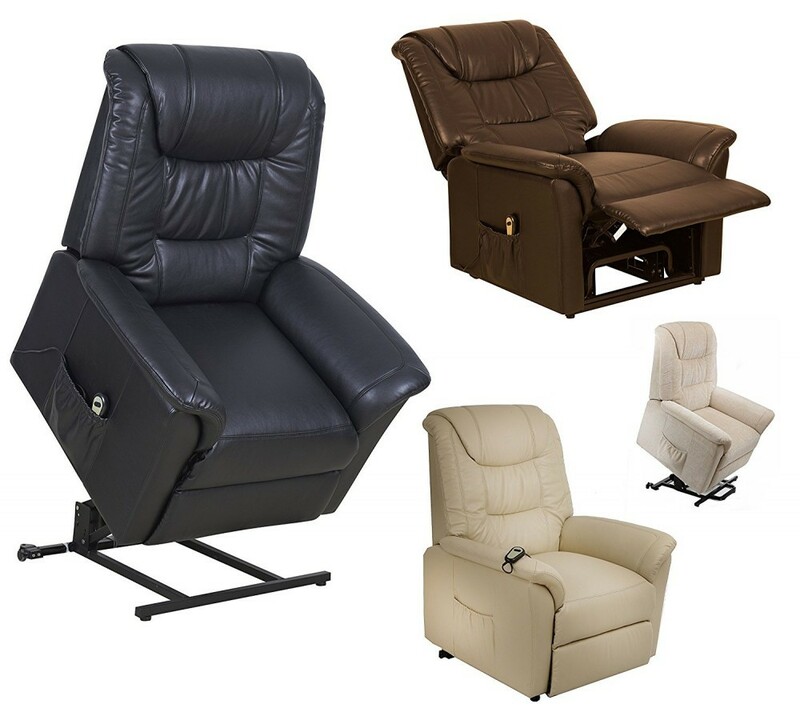 Some bath lifts and Recliner Bath Lift Chairs also have headrest attachments. Seat or lap belts and chest straps are also available for users with poor sitting balance to offer additional postural support when bathing. Other accessories include knee wedges that attach securely to the base of the seat. Soft and easy to clean they stop the user from slipping down, and helps to keep him or her in the correct, most comfortable posture. Washable hygienic seat covers and transport bags are also available . 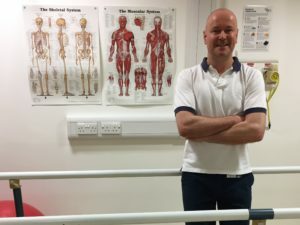 As a Healthcare Professional, in my job as a Physiotherapist, Click here and you can read all about me, I work closely with an Occupational Therapist when assessing someone in their own home with their mobility, transfers and personal care. I advise and recommend appropriate equipment for them, in order that that can manage to be as independent with their daily activities as possible. One such lady we were involved with recently was recovering from a fall at home where she had sustained a hip fracture. She spent several weeks in hospital initially before being discharged home with intermediate care (the service I am currently employed with), to provide support at home with her mobility, meals and personal care. The lady was keen to manage her personal care independently, and one of the things she wanted to start doing again was to have a bath. She had only managed a strip wash by the sink in the months prior to her falling, as her mobility was poor. We assessed her using a bath board, a fairly cheap piece of equipment that allowed her to sit with her legs in the bath, but wasn’t ideal. We recommended she try a bath lift and agreed to assess her at a local Independent Living Centre with a test model battery operated reclining bath lift. She was safe and independent using the bath lift, and now has bought and installed one at her house. Moving on 6 weeks from our initial involvement with Intermediate Care at home, the lady is fully independent, safe and managing her bathing and personal care. Is a Bath Lift or Recliner Bath Lift Chair for you ? For most people the biggest problem to bathing is getting in and out of the bath safely. This requires a combination of flexibility, strength (in both legs and arms), co-ordination, balance and good core stability, as well as good grip strength. Wow that’s a lot of things, but the main consideration at all times is a person’s safety. 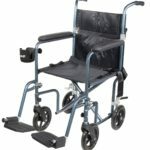 Bath lifts & Recliner Lift Chairs for the Elderly help provide comfort and support for you to manage your personal care independently when bathing. 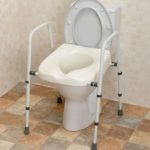 If you find that perhaps you are not quite ready for a bath lift chair, then there lots of other types of equipment that can help with your bath transfers enabling you to bathe. 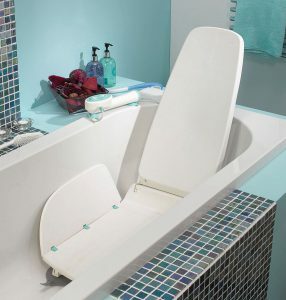 CLICK HERE to view an extensive range of Bath Seats & Chairs for the elderly. 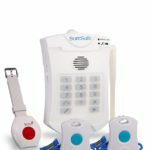 I hope you found the information useful, but if you have any questions, or perhaps a particular product you want advice about, please feel free to contact me at mark@elderlyfallsprevention.com and I will be glad to help. Thanks for the great information on bath lifts for the elderly. My grandma is old now and she will soon need a bath lift to help her manage her bathing independently. I have bookmarked for future. Thanks for the feedback. I am glad you found the information useful for your grandma. Wow this is an awesome post. I am in my mid fifties and would love something like this just to chill out in and relax. Looks like something I could really get into and would improve the quality of life of anyone. Great post! Thanks for the feedback, I really appreciate your comments. I am glad you found bath lifts and recliner lift chairs for the elderly useful for your mother-in-law. Please feel free to contact me if you need any further help or advice. Great information about bath chairs. Very useful for elderly people indeed. I never knew that so many options are available. I think I need one of those for my elderly uncle. Thank you for the information. Thanks for your comments. If your uncle needs any advice, or has any questions about which bath lift would be suitable for him, please feel free to contact me and I will be happy to help. 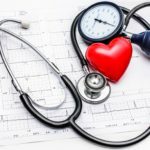 I´ve found this post very informative. 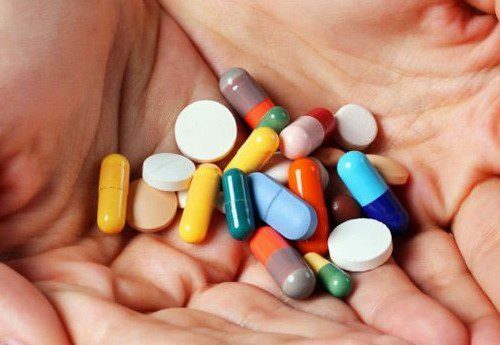 I´m a nurse and I can see how could this make my job much easier and taking a bath less stressful for my patients. I`ll share this post with my boss. Thanks for the feedback. Bath lifts take the stress out of trying to bathe independently, giving the patient comfort, support and safety at all times. Thanks again, Mark. To keep ones dignity is so important to an older person. These products you discuss and offer are exactly doing that. I never knew there are such a variety for different people’s needs. The Relaxa band lift looks excellent, easy to handle and use, that will be my choice if I need one. p/s If there are perforated holes in the seat it would make for easier rinsing if the water could drain. Thank you so much for your comments. As you said there is a lot of choice available when considering a bath lift. The Relaxa Band Lift retracts into the wall unit at the side of the bath so is out of the way when not in use, or other family members also need to use the bath. A good choice Stella.